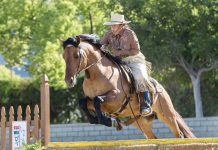 Revitalize your riding and get your horse back in shape for spring with these exercises. You’ve made it through the dark, cold days of winter, and promises of great riding weather shine ahead. Now’s the time to kick-start your schooling with boredom-busting exercises so you can have a happy and fit horse ready for spring riding. 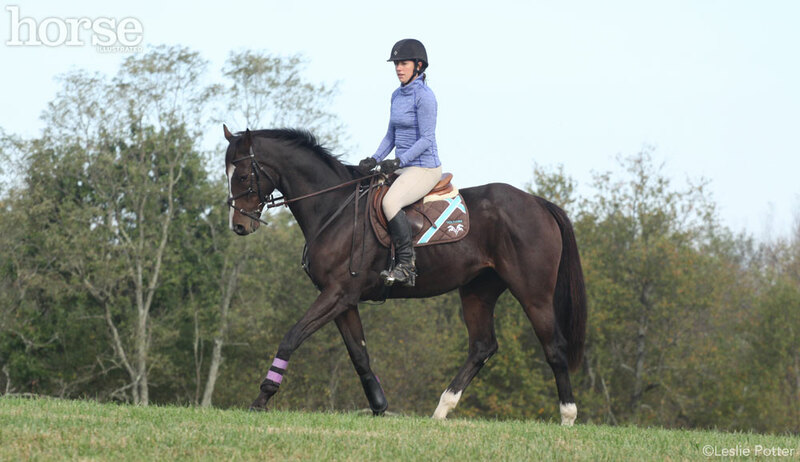 Grand Prix dressage rider Patricia Becker of Salem, Wis., shares her tips for getting back into training after some time off. Becker recommends keeping a journal to chart a course of training and stay on track. “Come up with a plan and a set of goals for your summer,” she says. Having a written strategy helps keep you committed to a schedule. Regular rides provide the conditioning and schooling needed for whatever events the show and trail season bring. “Keep track of how long you’ve ridden and what you’ve done,” says Becker. “Take some notes so you know if you’re moving in the direction you want.” Think both big picture (qualifying for championships) and day to day (riding round circles and straight lines). If you’re lucky enough to have access to an indoor arena, you can keep your horse in steady work regardless of weather or footing woes. The biggest trick here is staving off the boredom of working within the same four walls. 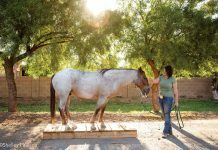 Keep your horse mentally sharp with exercises that keep you out of a rut. Make use of transitions and figures to encourage your horse to remain disciplined and tuned in, says Becker. 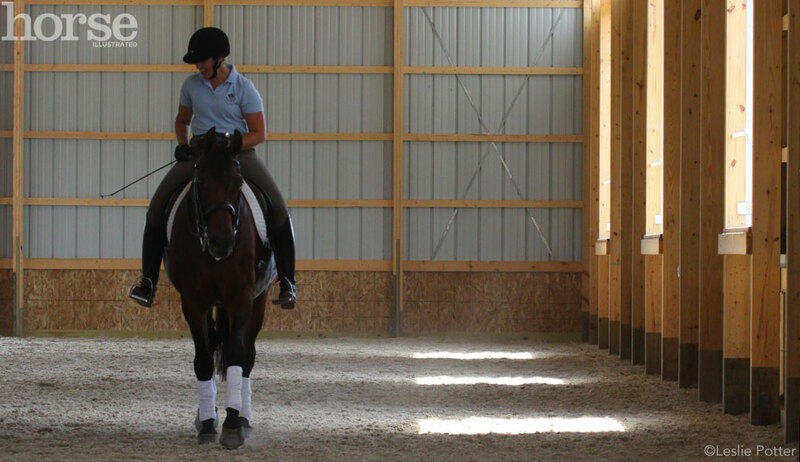 You can start out simple, riding in posting trot and focusing on establishing a new bend as you change your diagonal over the centerline. Step up your game by then moving on to trot-walk-trot transitions over the centerline, then trot-canter-trot, and even canter-walk-canter. You can also tighten up the figure with a four-loop serpentine, or change your exercise to a figure-eight with large or small circles. “Ten-meter circles are a super tool for suppling,” says Becker. She recommends an exercise using a series of three or four small (10-meter) circles spaced down the long side of an arena. Ride each circle at the trot, and as you approach the wall, make a downward transition to the walk. The wall helps set up the horse for a more balanced downward transition. Green horses can work on a larger circle, while more advanced horses can perform this exercise at the canter with downward transitions to the trot or walk. “Adding multiple circles with transitions helps the horse’s suppleness [and] obedience to the forward and slowing aids, and the repetitive nature of the exercise creates relaxation,” says Becker. Ride a leg-yield from the corner toward the center of the arena with a circle in the middle of the arena. When tracking left, for example, leg-yield off your right leg toward the centerline. In the center of the arena, ride a small circle (10 meters) right before leg-yielding back toward the wall off your left leg. This exercise not only keeps the horse thinking, but also develops bending, suppling and control. Springtime brings a much-needed breath of fresh air. Now is the time to get your horse out and about. While footing on trails and outdoor arena surfaces may not be optimal, there’s still plenty for you to do. Even if the footing isn’t perfect, there’s plenty you can do outside in spring. Brisk walking builds muscle, especially if there’s an incline. Start with a brisk walk, whether down the farm driveway or through the pastures. “A long walk, stepping up in rhythm, is a good muscle-building and conditioning tool, especially if there’s a variance in grade,” says Becker. Even if you’re doing the bulk of your work indoors and hacking out afterward, hold yourself to a high standard. Your horse can walk out with energy and be on the bit, supple and obedient. Take every opportunity to practice keeping your horse’s mind on you outside of the confines of the indoor arena. “Train your horse to focus on you in different settings so when you’re at a horse show, he is still focused on you,” says Becker. For some horses, getting out and about can prove awfully exciting. Know your horse—if you think you he may be fresh outdoors, work him before going out. Ride with a buddy, if need be. As winter gives way to spring, make the most of your riding time, indoors or out. A tuned-in partner that’s supple and strong will be ready to step out in the season ahead. Natalie DeFee Mendik is an award-winning journalist specializing in equine media. Her personal horse passions include dressage and vaulting. Visit her at www.mendikmedia.com. This article originally appeared in the April 2016 issue of Horse Illustrated magazine. Click here to subscribe! Good advise, and will copy and reread it often. Good reading…..now to see if I can remember it all. Can not wait until some of the mud dries up.